Stay with us for your next holiday, and catch some of Raglan's world-class waves! No matter your skill level Raglan has a surfing opportunity for you. Situated on a peninsula in the Raglan Harbour, Raglan Holiday Park is almost entirely surrounded by water. Vehicle access is by a lone road bridge making our Raglan accommodation a private hideaway. Just 2 minutes walk to the beach – this is peace and tranquility at its best. Raglan Holiday Park offers tent sites, powered campervan or caravan sites, backpacker type accommodation, cabins, Self contained and motel units. So look no further for your ideal Raglan accommodation. Fishing enthusiasts will enjoy the boat ramp being so close. With a sandy beach to walk, relax or swim - our beautiful Raglan accommodation has something for everyone. Children will love the playground and our huge jumpy pillow, plus Raglan has a rad skate park. And let us not forget our world famous Raglan surfing. A picturesque walking bridge conveniently links our Raglan holiday park to the main town centre where you will find bars, restaurants, shops and cafes. Due to Waikato District Council by laws, NO DOGS on the park (or any pets). Raglan Holiday Park offers a fully-equipped kitchen perfect for backpackers and camping families. And, we have a great outdoor dining area with electric BBQ's and picnic tables. Or even better, take the night off and visit the takeaway store just across the soccer field. Relax for an evening with a game of pool or air hockey in our camp lounge. And with internet access from dawn till dusk, you remain connected to the world when you stay at Raglan Holiday Park - your Raglan accommodation. With accommodation options from as little as $22 per adult per night, we have something for everyone. 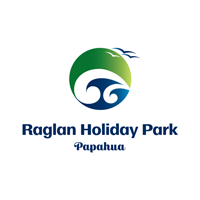 Please click here to view your Raglan accommodation options at Raglan Holiday Park.